Some members of a Silver Spring civic association recently tried to keep their new neighbors from joining. While residents rejected the measure, the fact that the issue got consideration at all illustrates how people disagree on who "belongs" in urbanizing communities. Last week, the SOECA board proposed an amendment to the civic association's bylaws that would limit membership to "residents of the R-60 zoned areas," or people living in single-family homes. The amendment would effectively bar the new townhouse residents from joining. The association already keeps out people living in a handful of small apartment buildings within the neighborhood's borders, which are drawn to exclude nearby high-rise apartment buildings. Why propose barring the future residents of Chelsea Heights from the neighborhood association? On the community listserv, some residents worried that the Chelsea Heights residents could join the civic association and "out-vote" existing residents on neighborhood issues, such as whether to restrict cut-through traffic. "Will their interests as members of a higher-density tract development coincide with, complement or be in conflict with those of a neighborhood association composed of residents in single-family homes?" asked one resident. SOECA president Jean Cavanaugh noted that Chelsea Heights will have its own homeowners' association, and says that her organization would be willing to cooperate with it. "There are other civic associations that work side-by-side with large townhouse developments that have their own association," she told me. She added that this had nothing to do with the fight to stop the development. "We have no issue with the people buying property in Chelsea Heights. 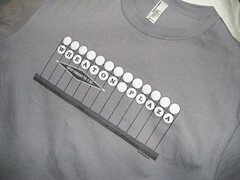 Our issue's with the Planning Board, the county, and [Chelsea Heights developer] EYA," she told me. "We can distinguish between who we had our battle with and the innocents who are gonna move in to Chelsea Heights." It's not unusual for neighborhood groups anywhere to fight development. 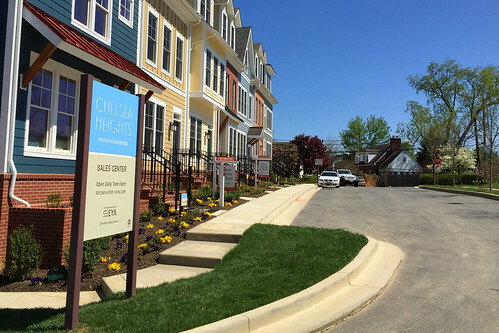 But in Silver Spring, a community that's generally progressive and tolerant and where many neighborhoods have a mix of housing types, it's unusual for associations to deliberately exclude people based on what kind of home they live in. "The fact that I live in an apartment does not mean I am any less impacted by a nearby development or the loss of a local park, than say a homeowner would be," says ESSCA president Megan Moriarty. "Furthermore, I think we can come up with better solutions if all voices are considered in the debate." "There are people who come [to Silver Spring] for the transportation, come here for the walkability, come here for the diversity," she says. "I'm not saying the people who came here 20 years ago, 30 years ago, 50 years ago don't want the diversity. But people who are coming here now...that's critical. It's a sea change for people who have been here for 30 and 40 and 50 years." Civic associations have a lot of sway in Montgomery County politics, largely because they're so organized. They provide a voice to thousands of residents, and they have done a lot of good in the county, from organizing community events to fighting highway extensions that would have cut across Silver Spring and Takoma Park. But civic groups also disenfranchise many people, whether by restricting membership to certain residents or by becoming adversarial towards people who disagree. That's one reason why participation in civic associations across Montgomery County is in decline. Just 20% of eligible households in Seven Oaks-Evanswood are members of SOECA. I've spoken to SOECA residents who supported Chelsea Heights and say they stopped participating because of the group's eagerness to vilify anyone who supported the development. "I couldn't think of a decision that had been made that I agree with," Brent said as to why she left. While neighbors who fight new development say they're doing it to "preserve" or "strengthen" their neighborhood, they ultimately weaken community organizations when they push out people who might otherwise want to get involved too. Change is a fact of life, but so is difference and disagreement. Community organizations do themselves a disservice by trying to squelch both. 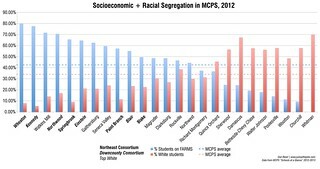 Besides, I bet that people buying houses in Chelsea Heights, or the renters who are already excluded from participating in SOECA, probably moved there because they like and enjoy the neighborhood. I bet they have a lot more in common with their single-family dwelling neighbors than some would like to admit. And now, we'll get to find out. 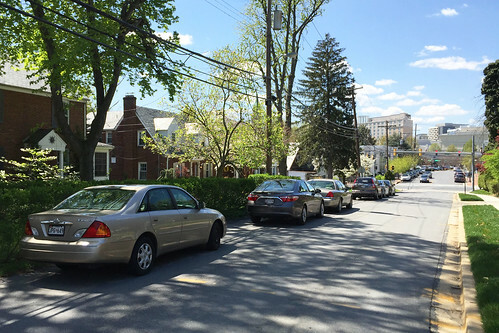 As Dan noted in the post, Woodside Park, the neighborhood across Colesville Road from Seven Oaks-Evanswood, has traditionally opposed rezoning for townhouses in our essentially R-60 single family zoned neighorhood. In fact, many of the lots in Woodside Park are 3 to 4 times larger than required by R-60. In addition to the R-60 lots, Woodside Park contains two small townhouse developments adjacent to the Silver Spring CBD and one entire block (at Georgia Avenue and Spring Street, also adjacent to the CBD on the Spring Street side) developed as townhouses. 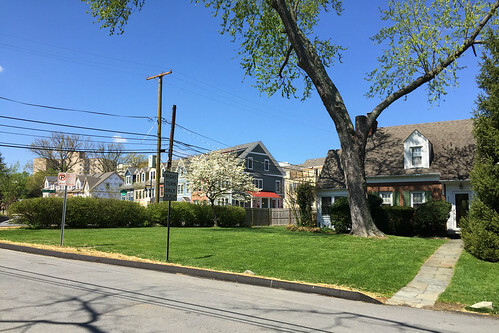 The latter was zoned for townhouses after the developer and the civic association reached an agreement concerning how the townhouses would be developed. Appropriately developed townhouses were seen as a reasonable alternative to various commercial uses that had been proposed for the block, including the new Silver Spring post office which was subsequently built at Second and Spring. Residents of all three townhouse developments have been welcomed at members of the Woodside Park Civic Association as soon as their homes were built. The Woodside Park Voice, the civic association newsletter, is distributed monthly to all the townhouses as well as all the single family homes. Although the townhouse residents' rate of membership is lower than that of residents of the other parts of the neighborhood, some have joined ($20 annual dues) and are valued members of the association. Over the years we have observed no conflicts of interest or disparity in voting on issues between the townhouse resident members and single family homes resident members in the civic association. The same is likely to be true in the future for the new Seven Oaks-Evanswood townhouse residents. Neighbor Paul Guinnessy asked me to post this comment: The implication in this piece is that many residents stopped attending meetings over the Chelsea Heights development but your piece only quotes one. It also seemed like a very personal attack on the SEOA leadership to me. Speaking as someone who has been involved in several associations, I think to pinpoint one action (CH) as the reason for lack of involvement by SOEA members in the community is simplistic. The most likely explanation is that people are generally busy with two working parents that don't have much time in the evenings to get involved without significant effort. I don't recall many association meetings in which I saw you turn up for example when you lived in the Parkhills area unless the Purple Line was on the agenda for example. Although I disagree with what Seven Oaks tried to do, I would point out that the motion was defeated in a democratic vote. Saying the SOEA leadership shouldn't be able to define their own boundaries is undemocratic. Our council leaders do it all the time (why else are districts so gerrymandered?) SOEA is allowed to do the same, and put it to the vote. There's nothing wrong with that. Its not like they tried to sneak it through in the middle of the night without telling anyone what they were doing. What I find particularly sad about your piece is the dismissal over the loss of the school. The Chelsea school was zoned as a school and the previous owners swore they would never sell to developers but only to another school. Unfortunately, the money looked too promising for them and they sold out in both sense of the words. So yes we now have the townhouses but I ask you, where exactly are these kids who live there going to go to school? Currently every school in this area is either reaching capacity or has already reached the 120% capacity mark, and that's before people move into the townhouses. Instead of selling out to developers what the planning board should have done was recommended to the council that the county buy the land and put a new school in there, but of course, there would be no revenue that way.